Before I get to today’s important late night nutrition lesson, I wanted to make sure you grabbed this brand new report that was just released to the general public recently. It shows you the 4 BEST foods to eat before bed and it has some really cool tips on how to KEEP your body in a fat burning environment while you sleep. I know it sounds crazy, but the dude is obsessed. He has 53 references and studies proving this approach can help you consistently burn more ugly belly fat. Before bed your primary focus should be keeping your body in an “anabolic” environment and maximizing growth hormone release. Vitally important processes take place while you sleep, so choosing the best foods to eat before bed will help you recover faster, prevent muscle breakdown, and speed up fat burning in a big way. But if you consume impact carbs before bed, you’ll spike insulin, which can block the release of growth hormone during the night. Because ANY type of impact carb consumption spikes insulin. And in the presence of elevated insulin it’s impossible to burn fat or adequately release growth hormone. Here’s the solution to MAX out your fat-loss potential before bed. A few hours before bed, consume a hefty serving of high quality protein. This will give your body all the essential nutrients it needs to recover adequately, while allowing enough time to let insulin stabilize before bed so you can maximize growth hormone release. ….You probably didn’t know that certain proteins are BAD NEWS as a night time food choice and can even spike insulin levels higher than carbs. 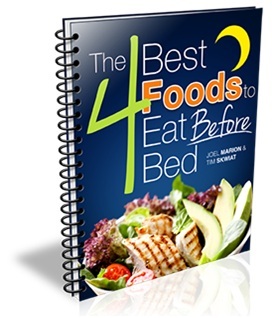 But at the link below Joel shows you, specifically, the top four foods you SHOULD intentionally be eating late at night to maximize your fat-burning potential. Please share or “like” us!